AMERICA’S NEXT GREAT RESTAURANT: Backed by Bobby Flay, Chipotle, Others! NBC is bringing a refreshing style of restaurant competition show with “America’s Next Great Restaurant”. The investor aspect of the show is similar to “E!”s “Bank of Hollywood”. In that the show gives contestants the opportunity of seed money to start their own business from four wealthy entrepreneurs . 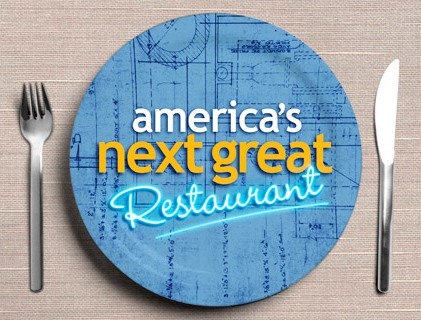 In “America’s Next Great Restaurant”, there are four professionals who are very successful in the restaurant business providing the funds for the winner of the show to start their own fast-food chain starting with the opening of three restaurants. The main difference is, they will also be partners in the winning restaurant business. A conference-call was held this morning with two of the investors and on-camera mentors on the show, Bobby Flay (master chef, restaurateur) and Steve Ells (founder of Chipotle). Bobby Flay stated that he was hooked on the idea from the first pitch meeting. He said that the two biggest attractions for him to do the show was that one, “It’s a great way to mentor people”, and two – “This is a perfect opportunity for people to pitch to four people who’ve had success in the restaurant business”. Flay also stated that he loves mentoring because it gives him a chance “to give back…I made a lot of mistakes through the years. Why not pass down those mistakes to prevent people to not also make them”. Steve Ells said that during the filming of the show, the team of investors were able to give contestants advice in the way of challenges. This allowed them to show people that “it not only takes a great idea, but also the ability to build a strong team that can execute their vision.” Challenges on the show will integrate real-life restaurant issues. These challenges also tests contestants’ ability at problem-solving, and how well their marketing skills are in branding their business. Some examples that were given by Flay were: logos, uniforms and signage. How much of an impact contestants’ business savvy skills had on the investors vs. a creative food business will be interesting to see in the show. Ells stated that although the “important trend in the U.S. is eating healthy”, that had no impact on their selection of top contestants nor was it mandatory. However, he does think that restaurants similar to his Chipotle “fast-casual” is the new fast-food. The grand prize in monetary backing of their new restaurants remains to be kept under-wraps. Flay responded that “we’re not disclosing that information. We are all equal partners”. Ells commented that this show is different because they are so invested in the contestants. Whomever wins, “the real prize is that this is an ongoing prize where they win the opportunity to continue to grow their business”. “America’s Next Great Restaurant” premieres Friday, March 6th at 8-9pm PT before the new season of â€œCelebrity Apprenticeâ€ on NBC.